So it's official, Chile is the first stop on the 16th season. So are they going to stay in Chile for leg2 or continue onto another country? "El Castillo Wulff", as it is called in Spanish, in 1930Current Headquarters for the Unidad de Patrimonio de la Municipalidad de Viña del Mar (Viña del Mar City Hall Patrimony Unit). Located on 37 Marina Avenue, it is almost hanging over the sea. Mr. Gustavo Wulff, German saltpeter and coal trader, as well as maritime transporter, migrated to Chile in 1881. In 1904, he bought from Dr. Teodoro Von Schoeders 1,260m2 in front of Cerro Castillo (Castle Hill), in Viña del Mar where he had a house built and ready in 1908. By 1917, Mr. Wulff hired architect Alberto Cruz Montt to make the house into a castle. Eventually a new tower was added built upon some rocks on the northern side of the castle, and a bridge joined them together. In 1946, Mrs. Esperanza Artaza Matta inherited the property, and asked another architect, José Alcalde, to transform it again. The southern tower was suppressed. The City bought the castle in 1959. From 1960 until 1988, it housed the Museo Naval de la Armada de Chile (Chilean Navy Forces Museum). Between 1990 and 1999, it lodged the collection of the writer Salvador Reyes Figueroa. In 1995, it was pronounced a National Historical Monument by Chilean Law. Just out speculation, I think the race will go South America to three possible continents. South America to Africa, South America to Oceania, or South America to Europe. Past seasons that used South America as the first few stops, often go on to other continents: S2 Brazil-South Africa, S5 Argentina-Russia, S7 Argentina-South Africa, S9 Brazil-Russia, S11 Argentina-Mozambique, S13 Bolivia-New Zealand. So all I am saying, this seasons route could include either Africa, Europe, or Oceania after the first two-three legs in Chile/South America. Only one flight I could find out of Dallas/Ft. Worth to Santiago, AA flight 945, departing 9:10 p.m. I might have figured out where the possible switchback for this season is. Look at Season7 when they drove from Chile to Argentina across the Andes on Leg 3. Remember the Roadblock on that leg, where they had to eat all that meat and some of the teams decided to not finish it and endure a 30min time penalty. That was a memorable moment. I know that is going to happen! That MUST happen! Best Roadblock ever! I came here to read that? knock it off please! Yes, thank you YY and to RFF! This is the only Dallas >Santiago flight tonight. My SPEC is that the other half of the teams may be flying via Miami. Thanks! Huge JeJo fan here. 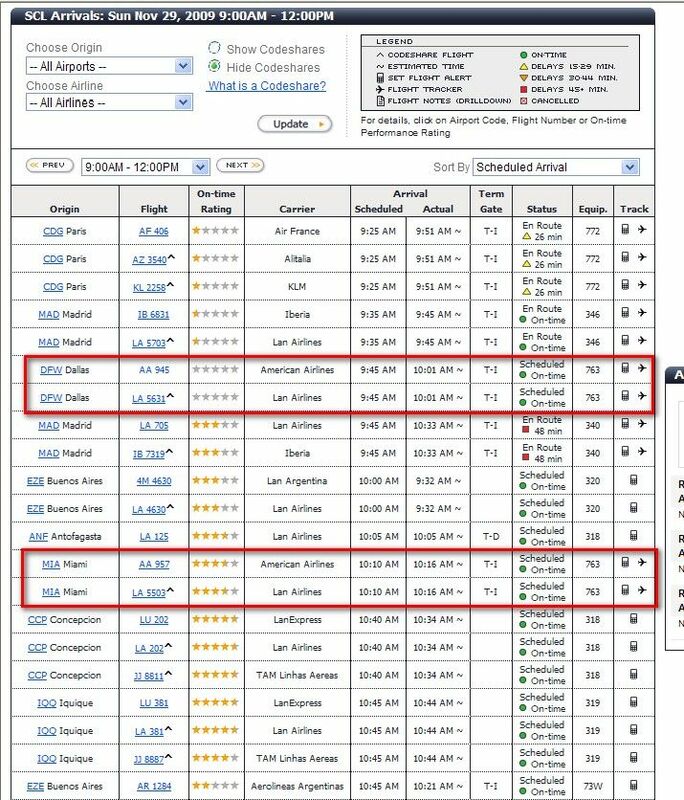 Two flights out of Miami tonight to Santiago Chile, LAN flight 501 leaving at 8:20 pm and AA 957 leaving at 11:45 p.m.
ETA, I doubt those on the flights to Miami will get out of Miami before 11:45 pm, unless they can get off the LAX flight and to the gate that takes them to Chile in five minutes b/c the LAX flight logically they'd have to be on, to Miami, which left LAX at 2:30 pm, gets into Miami at 8:15 pm and the Santiago flight leaves at 8:20 pm........so from everythign I just spent six million years researching, it looks like those that went to Dallas should get to Chile first, unless some miracle happens for the Miami folks to get on that 8:20 pm flight. here is my spec: These two flights arrive close toegther. ANYONE IN MIAMI WHO WANTS TO PLAY?? PM ME!! Yeah what they said, I was just going to post that too. 15 min lead time isn't great, but it's better than nothing. Plenty of seats available on the Dallas flight, the AA website shows 58 open seats, the Miami flight shows 24 open seats. So this is it, approaching the Yucatan? Too bad there's nobody I know in Santiago. November 28-29, 2009 from 5:00 a.m. to 7:00 p.m. Turn left on Figuero Street as soon as you exit the 2nd Street Tunnel. Hotel is about a block and a half. That's strange b/c AA 945 leaving Dallas to Santiago hasnt' left yet for Chile! Maybe she just misheard Wulff. Nvm, two different people had it in two different threads. Oy, this is getting confusing. I think it looks plausible! Is it? Sorry Slowhatch, I know it needs to be sorted out but I'm still looking for sightings. ...and if you exit the tunnel at Hill, turn left and go one block to the Civic Center Station (Metro).